2 Bed / 2 Bath Apartment in Midlothian VA | The Park at Salisbury | Luxurious apartments in Midlothian, VA where modern amenities meet traditional qualities - customer service, architecture. Feel at home the moment you walk in the door. The Park at Salisbury's apartments in Chesterfield, VA offer affordable luxury and lasting community. Enjoy spacious 1, 2 or 3 bedroom apartments that boast recent upgrades like brushed bronze hardware and fixture finishes. Large bedrooms with walk-in closets, high ceilings, and a private patio or porch give you plenty of space to spread out. 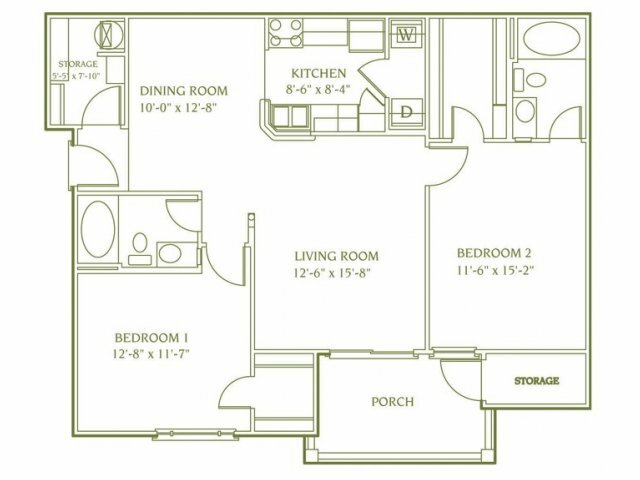 Naturally laid out floor plans make the most of the pond view and bright sunrooms in select apartments. Pets welcome! Breed and weight restrictions apply * One time non-refundable pet fee: $350 fee for one pet; $450 fee for two pets * Limit of two pets per apartment. . NO MONTHLY PET RENT! GET COMFORTABLE. WE DESIGNED YOUR HOME FROM THE START TO SET A NEW IDEAL IN COMMUNITY LIVING.